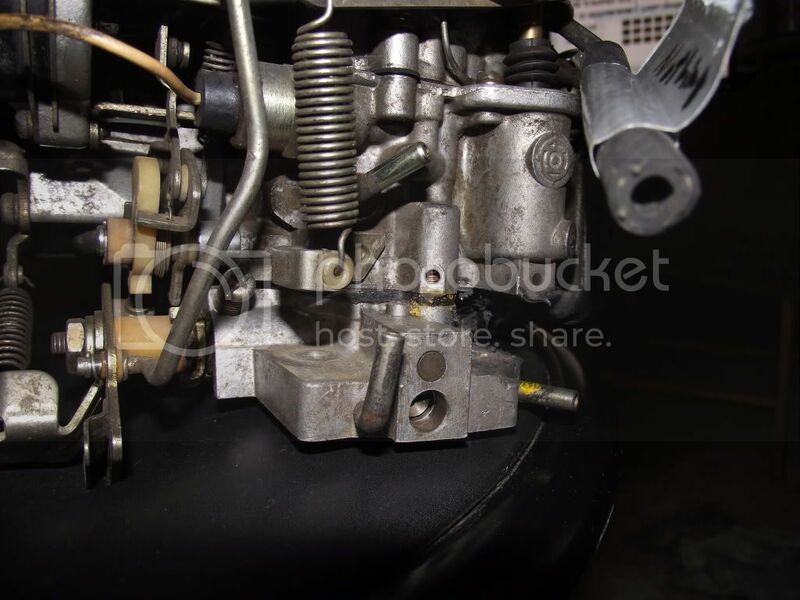 We frequently get questions about carburetors on this forum. These photos can be used as a reference for people who have carb questions. This first post is just a start and more photos can be added, including rebuild photos and internal parts. Let's use it as a resource to help each other solve carb problems. I suggest a similar post can be started for Weber conversions. Last edited by fastboatman29212 on Tue Jan 24, 2012 12:32 pm, edited 1 time in total. great idea fastboatman and great pics. I'm having fun taking apart a carb I bought to use for spare parts. Here are some more pics. I may eventually rebuild it, but more likely, I will rebuild the one already on my truck and just use this one for spare parts. It's kinda fun learning how to take it apart. Of course, this post is incomplete, but more will come. My goal is to take the carb apart, then put it back together again . . . . THEN . . . take it apart again with step-by-step pics. Wow! That will be fun! Link to exploded view of a similar Hitachi carb. 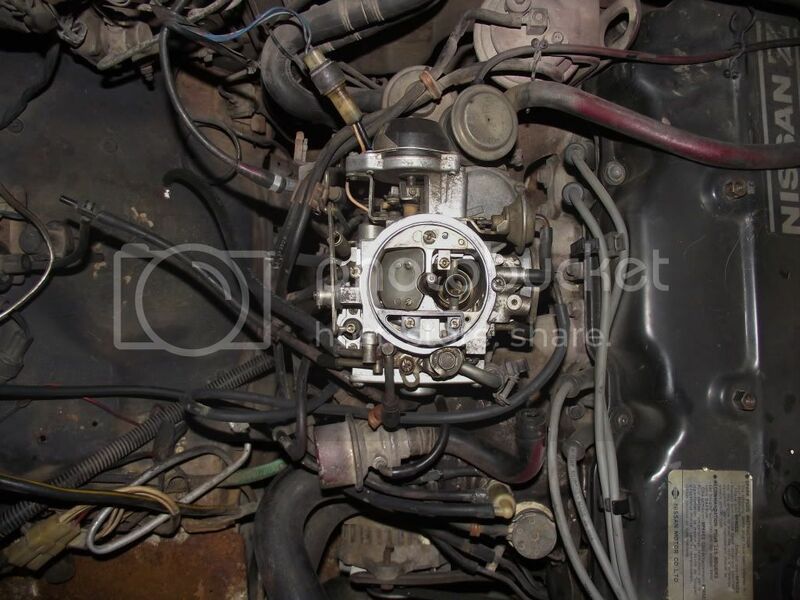 link to article about how Hitachi and Weber 32/36 carbs differ and basic function to help diagnose and tune the carb. WORTH READING! Hello! 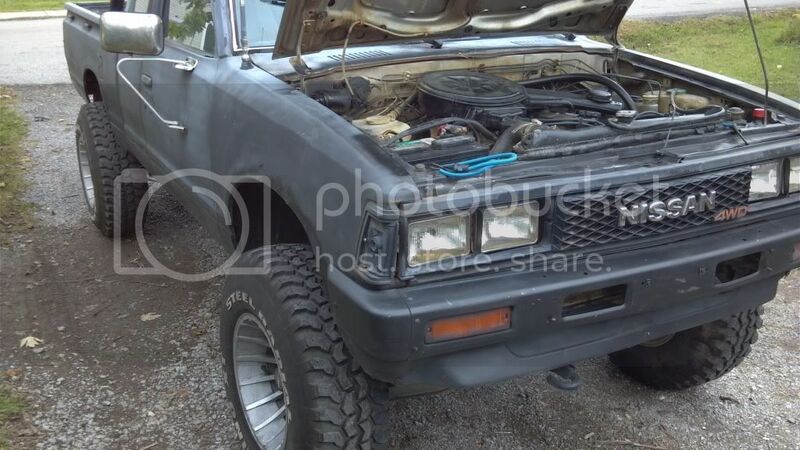 I recently aquired a 1983.5 Nissan 720 King Cab 4x4. The previous owner did a hell of a job on the suspension... and a hell of a job wrecking everything else! I am having a bit of trouble out of my carb. The original carb has been replace and a manuel choke added, but he also cut the choke cable that should run into the cab of the truck. When the engin is cold there is a "dead spot" when the accelerator pedal is barely pressed in that causes the enging to die. Once at temp it runs fine. I'm pretty sure I have it idled correctly. Do i need to replace the choke cable? rebuild carb? I dont want to put much money into this cab, as I am saving up to put a Weber on it. It sounds possibly choke related. Hard to say for sure. I'd add a bottle of carb cleaner to a 1/2 tank of gas and run it almost dry just to clean up whatever that can do. Do you think you can hook up the manual choke again? I'd also try that. The carb rebuild on these things ain't for the timid, but I did one and it worked fine. I bet you'd be happy with a Weber's performance though. Thank you for the response! Geart idea with the carb cleaner. Unfortunalty The manual choke cable is absolutly shot and is about to be removed. I believe I can handle the carb rebuild, I just havent priced a rebuild kit, I'll find out tomorrow. If a rebuild+choke cable+effort= too much then I'll just wait till I can afford the Weber (anybody have one sitting on a shelf in there garage? haha) and just deal with the terrible cold start. fastboatman29212 wrote: Link to exploded view of a similar Hitachi carb. fastboatman29212 wrote: It sounds possibly choke related. Hard to say for sure. I'd add a bottle of carb cleaner to a 1/2 tank of gas and run it almost dry just to clean up whatever that can do. Do you think you can hook up the manual choke again? I'd also try that. I went ahead and replaced the choke cable ($10 might as well). My truck didnt give me half as much of a struggle to get it started this morning and its was 36 degrees out. Putting some carb cleaner and some non-ethenol in it today. Is there anyway to tell what kind of carb is on it? Pretty sure its not the factory one. Take a picture of the carb and post it. If you want, send it to me as a picture message from your phone and I'll post it for you. Then the forum members can see if they can help. I'll send my phone number to you in a PM. The previous owner installed the choke cable wrong. It kinda works now. Is this the original carb? Yes That is a Hitachi carb and is original. I might have a few spare parts if you need them just ask. Can anybody point me towards a good write-up on properly deleting the vacuum lines? They are an absolute mess on my truck. I'd really like to take a pair of pliers to the meth heads finger nails who got ahold of this thing. Hi, I have an 86 720 z24 that needs the little white plastic fast idle cam. Any idea where I might be able to find one? I contacted Nissan and Nissan parts zone, but no one makes them anymore. Kennythecomputerguy wrote: Hi, I have an 86 720 z24 that needs the little white plastic fast idle cam. Any idea where I might be able to find one? I contacted Nissan and Nissan parts zone, but no one makes them anymore. I have a spare carb for parts. If you can tell me EXACTLY which parts you need, I will send them to you. You just pay the postage. I am missing the fast idle cam, the spring that goes behind it, the spacer and the c clip ( There is a picture above in the original post that shows the exact 4 parts. Its picture 3 and the parts are circled.) 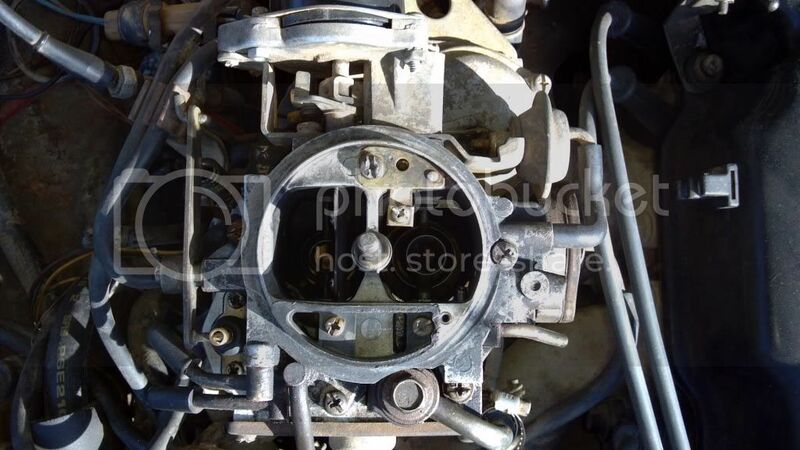 I might even be interested in buying the whole carb from you if it is in good shape and you are willing to part with it. The carb I have is the one in the photos of this post. It is not complete. No dashpot. Needs a rebuild and maybe a small part or 2 plus the wiring harness is jacked up. If you really want it, it would be about $11.50 postage, maybe less. The fast idle cam stuff might only be $3 to ship. Your choice. In reference to Fastboatman's photo #5: is the hose on the passenger side the fuel return? Mines's an '84 and has been capped like Matthom's is in his 3rd photo, even after rebuild the carb spits out WAY too much fuel. Any chance i could get a photo of where that hose connects to? Top of valve attached to the front of the manifold? I have a weber carb still in the package but i don't want to use it if i don't have to. Great Photos by the way. forester44 wrote: In reference to Fastboatman's photo #5: is the hose on the passenger side the fuel return? Mines's an '84 and has been capped like Matthom's is in his 3rd photo, even after rebuild the carb spits out WAY too much fuel. Any chance i could get a photo of where that hose connects to? Top of valve attached to the front of the manifold? I have a weber carb still in the package but i don't want to use it if i don't have to. Great Photos by the way. In Photo #5 at the beginning of this thread, the fuel bowl vent is partly hidden by the yellow number 5. Other pics show a white cap on the vent because the prior owner had broken off the vent tube. Photo #5 also shows the return fuel line well. Just to the right of center in the photo is a circle around the PCV. Using that circle like a clock, look outside the circle at 7 o'clock and you will see a metal tube that is bent at a 90 degree angle. 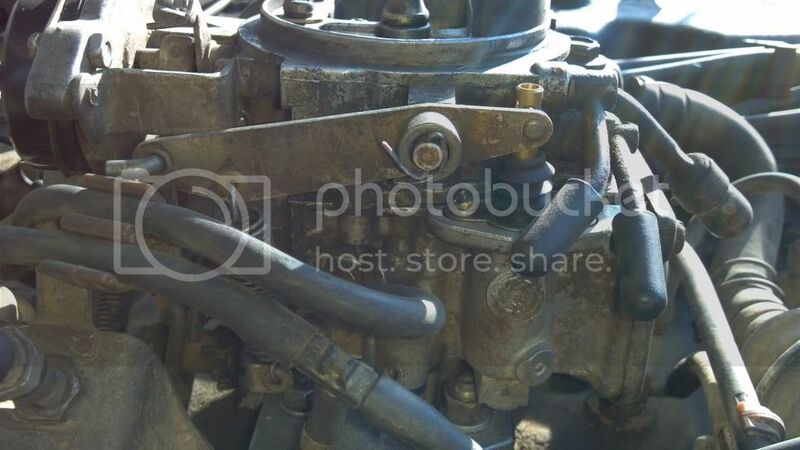 THAT is the return line and it comes off the fuel feeder line just before the rubber hose connection the the carb. If you study the Vacuum Line Placement pics in another thread, you will learn a lot more about what all these lines are for. You should also study the carb rebuild thread for additional knowledge. Here is a photo from the Vacuum Line post. The fuel return line comes off the fuel port right next to the feed line. When the fuel bowl float closes the needle valve to the bowl (because it's already full) the return line allows excess fuel to completely bypass the carb and return to the tank. 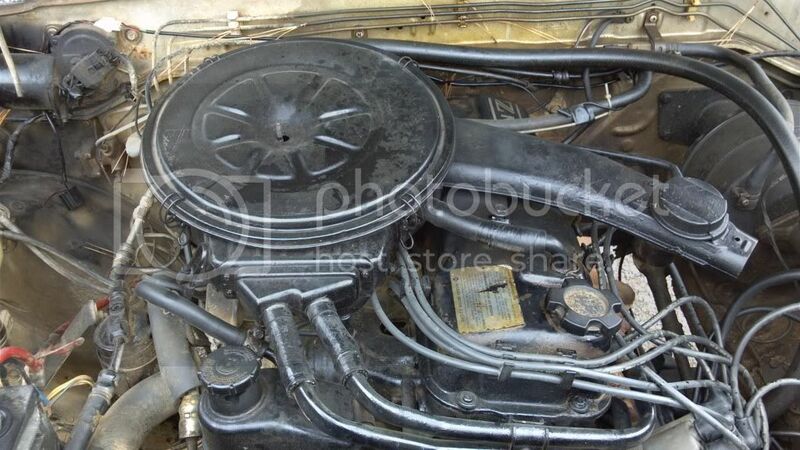 If you can find the hard line from the tank to the carb, then the return line runs right along beside it. If its needing a rebuild then just getting the cam parts would work for me. I have enough on my hands rebuilding 1 right now, lol. I get paid next thursday and then I will send you some cash. I really appreciate it, Ive been looking for these for almost a year. Wow, I just posted one of these carbs on ebay for sale! Guys, these pictures are great. I bought a pickup for my son and some guy changed out the stock carb with a Weber... and threw the old carb away. Now I am in California and need to go stock again to get it smogged. The rebuild cab I bought for $350 does not fit on because the studs on the intake manifold seem too long. It will fit with the spacer, but I am concerned it will not run right. Any thoughts? 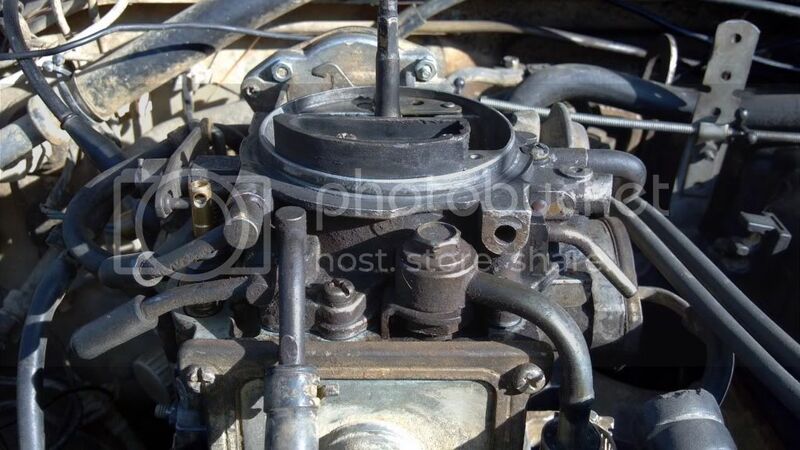 You should study the carb rebuild thread just to familiarize yourself with the carb spacer and gaskets. If the truck ran OK with the Weber, then it should also run OK with the rebuilt stock carb, but it may have less get up and go. Plumbing the vacuum lines might be a challenge, but depending on the year of your truck, most of the basic info can be found in the Vacuum Line Thread, which is also in the DIY section. Not sure if California will allow capping off the vacuum ports, but that will be an easier route to go if allowed by Calif. Hang on to your weber carb until you get the rebuilt carb running right. I used this thread to assist me in removing the carb from Ramona, my profile pic. Tons of help, so much so that I felt equally motivated and obligated to join the community to contribute what I could. The story for her goes as follows. I wanted a dirt cheap vehicle for next to nothing just to play around with. Ive done a few supervised builds in the past, but Im really still just a novice mechanically, so I wanted a good project that could grow with me. Anyway, she was the first thing I came across that was workable. Surprisingly, or I guess not so surprisingly, I fell in love with her immediately. She always had an exhaust leak, though, and after a bit of rough playing the clutch went limp. Secure in the knowledge I could do little to hurt her much more at this point, though, I decided it was time to get my hands dirty. I was sure to take plenty of pictures. the whole messy thing top down before I set in. ah-HA! Any ideas how best to plug this baby and fix the leak? simple silicone? special compound or part? new carb (grimace)? Well, my plans from here are to get this carb back into working order one way or another, then lay into the clutch. Ill have to do some research to figure out exactly whats up, but basically the clutch petal just went plain dead-limp so I figure its the clutch cable or a mounting bracket somewhere that broke. Hopefully I can fix it myself. My hopes for Ramona are to have her running as cheaply as possible, look into getting a(n extremely) cheap boost package for her and enter her into either the Le Mons or Chump Car races. Fun! Carb rebuild? Is that your plan? Or just cap off vacuum lines? What were you asking about in the last photo, the screw that's set from the factory? You can review my 720 Carb rebuild thread and it will walk you through an inspection of the Carb even if you don't rebuild it. well, a carb rebuild at this stage seems somewhat unnecessary, depending upon what I will eventually do. I'll leave that particular discussion for the build thread I'll make for Ramona later on (drinking and carousing planned for this evening), and for now just post a revised pic from earlier of the carb. I found a hole on the side that is unplugged, and which I think may be the source of the leak. 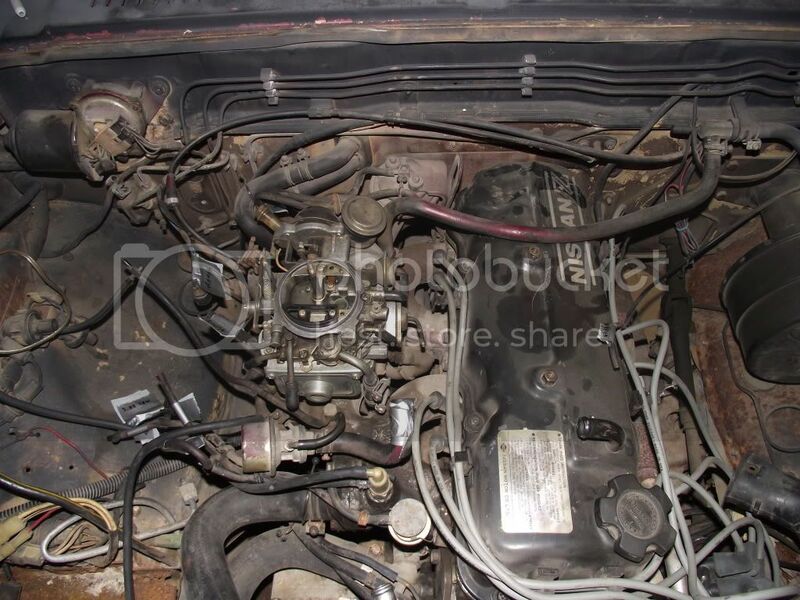 It is in the area where I had discovered the leak to be (starter fluid spray while running method), and if not there the only other idea I have would be a bad gasket. What do you guys think? And as Im new, please let me know if Ive moved a bit beyond the purview of this thread, and Ill repost elsewhere. Don't wanna clog thems ole tubes. You can plug that hole and it'd probably run just fine. If you wanna know what vacuum line hooks up there, just refer to the vacuum line thread in the DIY section.